Happy New Year to the Corona Community! As we wind down 2013, Walter and I wanted to thank all of you for your support. It’s been a great year and Corona has made great strides, solidifying its position as the leading 2D/2.5D development platform. 1) Graphics 2.0 – After many months of hard work by the whole team, we released our new graphics engine. This sets a strong foundation for a whole new set of amazing mobile experiences. We are super excited about this and our community has already started to blow us away with their cool ideas and effects. 2) Windows Phone 8 support – While the mobile market is exploding, it’s also becoming more challenging for developers to support all the key platforms. Over the last year we’ve seen Windows Phone 8 grow in market share and we decided it was finally time to support it. We partnered with Microsoft and we are working very hard to bring Windows 8 and Windows Phone 8 support to Corona in 2014. 3) Corona Plugins – This was a big one, as Corona Plugins have allowed us to offer Corona developers many more monetization options (as well as additional functionality) in a way that is super simple for developers to integrate and also allows us to decouple functionality from the core Corona engine. 4) Corona Editor – We’ve long had requests for a Corona IDE and we finally delivered. We decided to build Corona Editor as a plugin for Sublime in order to take advantage of the best text editor out there and we feel it delivers the best lightweight coding experience for Corona developers. Of course, much more was added to Corona this year (take a look at the release notes – here and here – for more), but these are some of the key highlights. 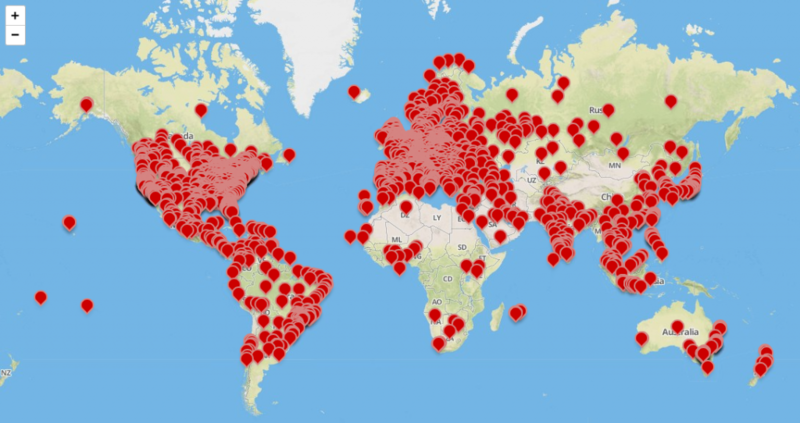 All Corona developers worldwide – now in 152 countries (see map below)!! Our Corona Ambassadors – you have proven invaluable in spreading the word and giving us feedback. Thank you! The Corona Team – a bunch of extremely talented and hardworking engineers and an overall great and fun group of people to work with. The goal behind Corona has always been to enable developers to build great apps as quickly and efficiently as possible. We look forward to making this even more true in 2014. Thanks everyone! Happy New Year to the whole Corona stuff and all Corona developers! Damire, jesi iz hrv ili regije? Well, greetings from Croatia and all the best to you guys. Damir, are you from Croatia as well?